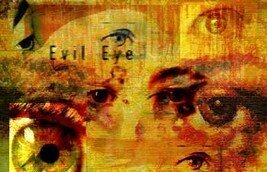 The term “Evil Eye”, Buri Nazar, “Drishti”, “Malocchio” has references all over the world. It is a popular term to believe any unexpected turn of unpleasant events. When we have a normal, routine life going on and suddenly, out of the blue, the apple cart is tipped by unprecedented unpleasant activities, with no plausible explanation, our elders assume it to the be ill-effects of the “Evil Eye” or the eye cast out of jealousy and envy. Total head and back of the neck pain and the feeling of heavy eyes. An acute uneasiness or apprehension: everything seems to go wrong. Stomach ache accompanied with dizziness and a feeling of vomiting. Amongst the babies, they cry without reason and have terrible stomach pangs and pain. 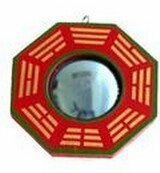 In China the remedy for the evil eye is the Pa Kua mirror, a six-sided mirror that is hung on the front door or placed in the front window to reverse bad energy back to the sender. Some of these mirrors are convex to reflect back the bad “poison darts” or “arrows” of multiple ill-wishers and some are concave to reflect energy in a definite direction back at, for instance, a nosy neighbor, whose gaze may have lingered on your home for too long. In Feng Shui, mirrors are often used as a cure all to reflect negative energy back at all kinds of things – people, bad architecture, traffic, neighbors, physical obstructions such as trees or rocks or anything else that might considered to be a conductor of Har Shui (negative vibrations). Indian women wear kohl to prevent themselves to get affected by the evil eye or the Buri Nazar. 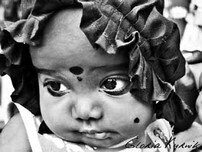 The new born babies are also placed a small black kohl dot on the forehead near the the hair, half-hiding in the hair to ward off evil eye. In India cords strung with blue beads are placed on newborn babies. When the cord breaks and the beads are lost the child is considered to have a strong enough aura to protect him or herself from the evil eye. Red cords worn upon the wrist or neck are thought to have a powerful effect against ocular malevolence or the “Evil Eye” or Buri nazar. Symptom 1: Child crying incessantly without reason, looks like a stomach upset or the reason is unknown. Remedy: Take 2 red dry chillies, some rock salt, mustard seeds and a few strands of the mothers hair and rotate over the child clockwise thrice and then anti-clockwise thrice, from top to bottom, front and back. Now take a hot plate- tava and put all of this on the hot plate. If the red chillies fumes irritates your nose and makes you sneeze then the evil eye was not there, but even after the red chillies have burnt to black cinder and there is no irritation, then the evil eye was strong. The baby will start to feel fine in no time. Symptom 2: Adult is feeling sluggish, irritable, sickly and loss of appetite for no reason. Remedy: Take some rock salt and the do the above clockwise and anti clockwise rotation over the head and immerse in a glass of water kept close by. 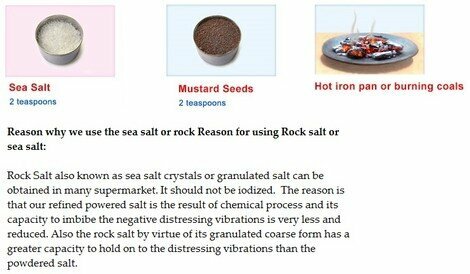 It is believed that as the salt mixes with water, the evil eye will also dissolve away. Symptom 3: A particular member in the family suffers from chronic illness? The reason could be very well due to evil eye of neighbors or relatives. 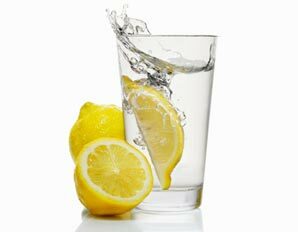 Remedy: Take sea water in a bottle or can and distill the water using a white cloth. After distillation, take the distilled water and mix a small proportion of ” Gau Mutra”(cow’s urine). Store it in a bottle and spread the water inside every rooms of the house during Tuesday, Friday, Full moon day and new moon day. This remedy will burn the evil eye and its resulting illness. Symptom 4: Frequent illness and loss of appetite for livestock’s. Domestic animals are also in unrest and seem agitated. Remedy: Do you know evil eye can also affect domestic animals? One of the way to remove this evil eye is by bathing the affected livestock’s using turmeric powder mixed in water. 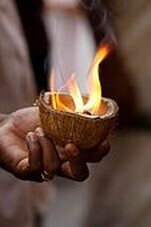 Another effective method is to rotate a burning coconut over the animals body to remove the evil eye. Symptom 5: Is your business running a bad patch, not getting the deserved success in business? Then it might be due to the evil eye of your business competitors. Symptom 6: Misfortunes, Bad luck, loss of fortune and jobless situation. These are some of the common evil eye effects. Putting up a photograph of the famed Panchamukhi Hanumanji is also a sure-shot way to remove evil eye and safeguard from negative energies. Vastu Dosha can be removed and nullified by this rare phtoograph. Symptom 7: Evil eye can easily affect pregnant ladies when they go out of the house, and such envious thoughts can affect the health of pregnant women.